Genre-bending, folk-punk sextet Skinny Lister released their new LP ‘The Devil, the Heart & the Fight’ back in September, but their current American tour in support of the album gives us occasion to circle back and give the record its due. Skinny Lister recently sold out an October UK tour on the heels of the album release, which is both a signal of their growing success and a measure of the LP’s singular merit. Skinny Lister made a lasting impression with their saucy second album, ‘Down on Deptford Broadway’, which they previewed at SXSW 2015 ahead of its release in April of that year. They spent the remainder of 2015 on the road, opening for their labelmate Frank Turner and bringing their incorrigible, rabble-rousing spirit to new audiences both at home and abroad. Wasting no time, the band dropped a preliminary announcement for album number three in April of this year, hit the studio in Newcastle with producer Tristan Ivemy in May, and released the new album’s first official single in July. That July single, ‘Wanted’, is also the opening track on ‘The Devil, the Heart & the Fight’. Its cocky verses and lusty chorus immediately seem familiar, but the springy guitar riff adds an unexpected flavour, suggesting straightaway that Skinny Lister have expanded upon their usual formula. Many of the songs on ‘The Devil, the Heart & the Fight’ retain the signature Skinny Lister combination of pub singalong and sea shanty, generated by the band’s unique instrumentation and folk dance influence. ‘Beat it From the Chest’ sings, at first, like any of the swaggering, foot-stomping tunes from ‘Down on Deptford Broadway’, but the electric guitar arrangement takes the place of the accordion, giving the song a more anthemic rock tone. The accordion’s folk flavour is more prominently featured in ‘Hamburg Drunk’, an unapologetic drinking song that abruptly switches tempo between a fast stomp and a lurching sway. Following the country rock ballad ‘Grace’, Skinny Lister get back to their roots with the punk-leaning ‘Charlie’ and penultimate track ‘Fair Winds & Following Seas’. Album closer ‘Carry’ is simple and heartfelt as it gradually swells from a delicate love ballad to an uplifting and fully-realised singalong anthem. ‘The Devil, the Heart & the Fight’ is a surprisingly concise record, given the multitude of its musical influences. The album’s 12 songs span only 36 minutes in total length, and its production is somewhat restrained in comparison to Skinny Lister’s typical boisterous roar. This slightly scaled-back dynamic reveals the band’s thoughtful and subtle musical experimentation, highlighting the truly multi-faceted and genre-defying nature of their folk-punk-pop-rock style. Though Skinny Lister’s rough-and-tumble personality is a bit subdued in this studio recording, I have a strong suspicion, based on previous experience, that these songs will only gain energy and vitality in live performance. 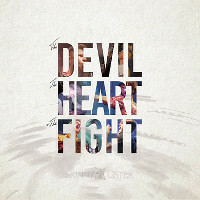 Skinny Lister’s third album ‘The Devil, the Heart & the Fight’ is out now on Xtra Mile Recordings. The band’s current American tour extends through November and into the first part of December; you can find all the dates on their official Facebook. They have also announced a list of Spring 2017 headline dates in the UK, which we’ve listed back here. TGTF’s full previous coverage of Skinny Lister is collected here.